I grew up as the youngest of 3 siblings. Our dad was a minister in an evangelical church. It featured lots of sermons and praying, but my favorite memory is the singing. Also in the smaller circle of our immediate family, there was much singing and playing of instruments. I was about 9 years old when us three siblings had our first public performance at our aunt's wedding. My older brother Niels wrote and arranged the songs and accompanied our three-part harmony vocals on guitar. Eventually at age 11, I began playing the piano and in time got to accompany one or the other of our songs on the piano. My grandparents paid for my first piano lessons. However sheet music never got along with me, or was it the other way round? Either way, we never developed a good relationship and parted company. That was that for the piano lessons, too and ever since then I've played purely by ear. That's when music caught fire for me. I'd play for hours in the empty church hall in Hamburg-Harburg dreaming of one day performing in front of an audience. On the 1st of May 1976, just before my 16th birthday, we emigrated to Canada - specifically to Calgary in the west, close the Rocky Mountains. I'll never forget saying good-bye to my friends and to my first love! Equally unforgettable are the first impressions of our new home. It was a dramatic incision and new start for each one of our family. In the fall of 76, I arrived at Bowness High School and within a week my sister Astrid and I gave our first concert at the school auditorium. Niels wasn't with us, since with graduation already under his belt, he was about to start university. This performance gave us a good start into our new school environment. Our music teacher Dennis Orr was enthusiastic and supported us with unbelievable dedication. He made an electric piano available to me and got us our first gigs. I especially remember the first paid job. We were a three-piece, 200 bucks for a Friday/Saturday in a downtrodden bar in Olds, Alberta, a small town north of Calgary. That was in early 1977. In 1978 I decided (with my parent's blessing) to quit school and to pursue music full-time as a profession. 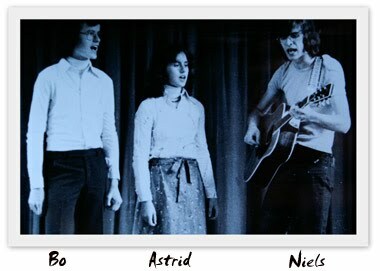 In the beginning us 3 siblings performed together again as "Harbinger". Then I had my "Boogie Band" while my siblings went their own ways. It was 1979 - I was playing with my band in the Forest Lawn Hotel in Calgary, a scary place frequented by life's unappreciated and failures, when some guy asked me if I could imagine playing with Ian Tyson. Ian is a big name in Canada and I was convinced someone was namedropping to appear important. Not so! The first big step in my carrier happened in this lousy watering-hole and I learned an important lesson: There are no unimportant gigs! The time with Ian Tyson and his band gave me a lot. Back then there were no schools for pop and rock musicians. This and other bands were my school. And whoever had played with Ian Tyson ended up with a kind of a diploma: Reputation. With this bonus I landed within a year with the underground star of the scene, Gaye Delorme. Highlight of my work with Gaye was the production of the music for the Cheech and Chong film "Things are tough all over". 1982 I went to Los Angeles and experienced a dark side in our business, when I didn't get paid for some work I had done for the movie. So I decided to become my own boss again and resurrected the "Boogie Band". We called ourselves "Final Notice" and later with a different formation "Studio Venice" (it sounded so European). My sister joined Studio Venice in 1984. 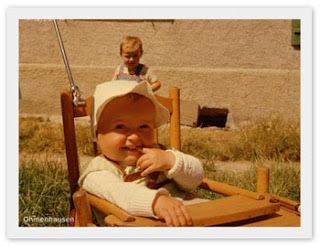 As a trio we decided in 1985 to try our luck in Germany where German New Wave (Neue Deutsche Welle) was in full swing. I wanted to be a part of that somehow. We landed in Hamburg with a container full of equipment, 100 demo cassettes and our dreams. We played in the old "Onkel Pö", in the "Knust", at the "Logo" and in the Harburg "Riekhof" as a Canadian band. And indeed we were discovered. Publisher and producer Ulf Krüger attended one of our concerts at the "Logo" in Hamburg and he introduced us to his publishing company partner Django Seelenmeyer and before our first year was up, we had a record deal with Intercord. Published the single "Don't talk anymore" by "Studio Venice". Unfortunately the band didn't last. My sister as well as bass player Ben Harries went back to Canada and I continued as Beau Heart. I wrote songs and recorded demos which Django pitched to record companies. One of my demos "Coming back to you" landed on the desk of WEA's AR manager sometime during 1987. Although not really knowing what to do with it, he played that demo to drummer and producer Curt Cress. Curti must have quite liked it, since he wanted to get to know me immediately. When I was introduced to him, I had no idea who he was and what stature he had in the business. We hit it off and after a jam session in honor of the music store "Amptown" in Hamburg, he asked if he could produce me and if I wanted to join him on tour with his "Curt Cress Clan". He produced my first LP "Invitation" and I got to do three tours with the "Clan". During rehearsals for the first "Clan" tour, I was approached by Gert Drögemüller. He asked if I was interested in working with musical instrument manufacturer Yamaha. As a result I worked for Yamaha for the first time at the 1988 Musikmesse in Frankfurt. Since then I've had a strong relationship with Yamaha. I've traveled to Japan several times to collaborate on various auto-accompaniment styles. I travel all over Europe to perform concerts showcasing Yamaha instruments. During 2002 and 2003 I toured several Central and South American countries on behalf of Yamaha. Just when you think, nobody is watching, someone is. Reminiscent of the Forest Lawn Hotel, it happened on New Year's Eve 1990. I was just jamming with the band "Floy" in Frankfurt. That's where I bumped into Christian Felke, the Sax player with the Klaus Lage Band. Klaus Lage happened to be looking for a new keyboard player and Christian suggested me. However I wasn't the only candidate. The audition lasted for three days and it wasn't just about music, but also about togetherness. We rehearsed, played cards and dice, drank - at times a lot - simulating harsh tour conditions. I got the job anyways. Years later, Klaus gave me the reason: Not only did I play along to a tune I hardly knew, but I also pitched in with some harmony vocals. He was impressed. I've performed hundreds of concerts with Klaus Lage visiting every region in Germany. In the early nineties I was on the road for about 250 days per year. There are fewer concerts these days, but we still play together. 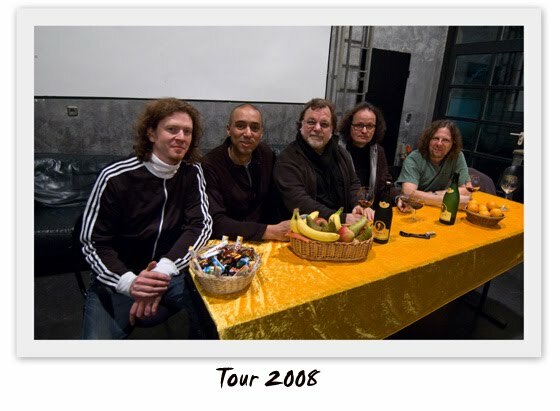 2009 will again feature many concerts with Klaus Lage. In 1993 I toured with Uwe Ochsenknecht. That was via Curt Cress who produced Uwe. While with Curti, I met Ali Neander (Rodgau Monotones), who in 1996 brought me to Edo Zanki. I had the absolute pleasure to accompany Edo with Ali Neander, Ralf Gustke, Susanne Vogel, Tommy Baldu and Neil Palmer. Along with Edo, I was invited to a benefit concert at Hamburg's "Stiftung Phönixx". Edo's friend Xavier Naidoo and my friend Lisa Cash were also there. I was supposed to accompany each of them during their solo performances. At the rehearsals for that concert, we decided to perform jointly and to sing backup vocals for each other. The performance was magical, spontaneous and special. 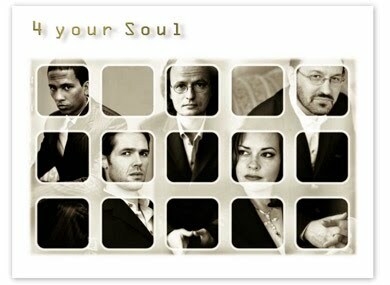 Thus "4 your soul" with Edo Zanki, Xavier Naidoo, Cae Gauntt, Tommy Baldu and Bo Heart was born. We recorded an album in 2001 and later recorded a TV concert (some excerpts can be found on YouTube). Eventually our album made it into the top 30 of the German charts. However the above formation wouldn't last for long and Xavier moved on and a year later, so did I. In 2004 I got a call from Jürgen Kumlehn, with whom I had toured for Yamaha during the early 90s. He invited me to join the band of Vicky Leandros as second keyboard player. When piano player Darius Zahir left for family reasons, I moved into the Piano seat. We also did a live DVD with Vicky, recorded in the CCH in Hamburg. Along with these activities in support of other artists or for Yamaha, I write my own songs and produce other artists. My second album "In my arms" was released in 1998 on the LamuR/Ariola label. About two years ago I once again started to perform solo concerts. And again, there's also a band "Bo Heart and Friends", but it's not really my band but three bands in one. I find it exciting to share the spotlight, to support and to be supported. Sometimes I play in the background, sometimes I'm center-stage. I don't want to miss either.